Once upon a time, not very long ago, there was a goldfinch. He lived in Spain, in a little nest in a hedge, in a wild part of the country, with thistles and old seed heads, near the old saltpans, where the flamingos and avocets live. 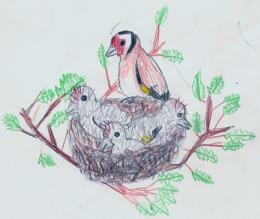 In his nest with him lived two other birds, his two sisters. If he were in a fairy story he would be called Goldy, or Redcap, or Flutter. But our goldfinch didn’t have a name, because he was only a bird, and birds don’t have names. He hadn’t seen much of the world, only the inside of his hedge, and his mother and father bringing him food. Sometimes he heard the wild birds calling, and the wind brought him scents, and the storms shook the nest, and he wondered what it was really like out there, but he didn’t want to go and see, because he was snug and well fed where he was.One day, when he was about two weeks old, and his feathers were quite clearly visible through his downy fluff, the breeze brought him all the wild scents, of the wild onions, and the avocets, and the lonely, solitary, redshanks, and the other goldfinches giving their little songs and squeaks, down near the water. He also heard another goldfinch squeaking near the nest. “Tweeet!” He answered. His voice wasn’t very good yet, but he was quite proud of it. 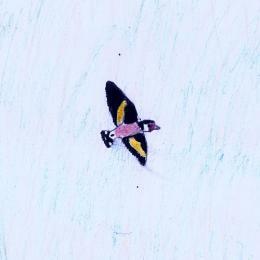 He leapt onto the edge of the nest and fluttered madly with his useless little wings. His sisters pushed at him as he struggled up to the edge of the nest. They were just as excited. And then he fell! He may have jumped, in which case it was very brave of him. He would like us to say that he jumped. We will say that he jumped. But it must be admitted that he was a little frantic then. How would he get back up? Then down came his elder sisters. They wouldn’t let their little brother leave them behind! Then their father came out from the other side of the hedge. It was him that had been calling! They all crowded round him, asking for food. His eldest sister got it because she was strongest. But after a while his mother came with more food and he got some. He stayed in that hedge, with his parents feeding him, for a few days. Then he found he could fly! He could not fly very well. He fluttered and flapped and jumped and fell, but it was good enough. Out he went, out from that hedge that had been his home. He was out! In the wind that ruffled his stumpy feathers and down, among the smells, the wild onion, and the stone curlew. He was so happy he could have sung. He did sing. It was a squeaky little trill, and not very pretty, but he swelled with pride, and tried again. He nearly got it right then. He found a few reeds and pecked at them. He liked the ones his mother brought him better. He wondered, if he went home, if he would get some. Maybe even a little grub. He made his way back to the hedge. But he found he was far from welcome. His father was chasing him away! He lost no time in fluttering away from there. Who would feed him now? He went back to the reeds, but another bird had got them. It hadn’t left him much. There were some birds flying and pecking over there. What where they eating? Ants? The young black redstarts were eating the flying ants. Well, he would rather eat seeds. He pecked up an ant or two. He wasn’t good enough at flying to catch the males or queens. But now he was covered in ants! That’s why the birds were not down by the ant nest! He hurried away. Another empty seed head. The other birds had got there first. Then he found a thistle. He ate all that remained of the seeds and went to sleep under a nearby bush. In the morning he went back to the thistle. It was empty, but he found some seeds scattered on the ground. Then he practised his flying. He was better at it now. He fluttered and flapped and flew over the blue sunny sky. Soon his little wings got tired, and he sat in a bush. He found some seeds there. They were like the one his mother used to bring him. Now the little goldfinch began to feel lonely. In the nest he had always had plenty of company, with his two sisters, his parents, and the egg that never hatched. More company than he wanted, usually. But now, for the first time, he began to feel lonely for his own kind. He went to the edge of the saltpans, were he had heard the goldfinches chattering to each other as they gaily stripped the thistles of their seeds, but the flock had moved on, and his mother and father had gone with them. He did not know were his sisters were. One day he decided he would go and try to find the flock. He flew east, towards the sea. When he got there he landed on a sea holly and stared at the vast stretch of water. But the pounding of waves and salty smell frightened him. He ate some of the sea holly seeds, but even those did not taste like the good onions or reeds that he was used to, so he flew back in land. 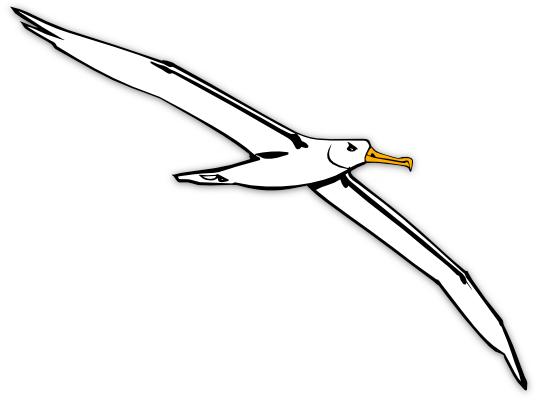 He flew on past the saltpans were he lived, over the road, and towards town. He landed on a tower block for a while to get back his breath. Then he flew on, over the buildings. Down, down, far below him, at last he saw the flock. They were all crowded around a big box-like thing, made of thin, strong, shiny sticks and twigs. It had lots of seeds in it. He flew down to join the feast. But could he find his way in? Well, a couple of other birds had done. His mother was one of them. His father fluttered round the cage, trying to find his way in. He probably didn’t recognise his son, any more than his son recognised him. At last he found his way in, leaving his father fluttering out side. Well, here was a feast set for any number of birds! Some rice, seed, and something he had not tasted before. Very good though. We call it cheese. Then a man walked up towards them. Time to go! Up into the air he swung, along with the flock. Bang! He crashed against the top of the box. He and the other goldfinches had forgotten they were in a box. But wherever they looked they could see sky, so it was not easy to look for the door. The man came up and bent over the cage and stuck his hand in. The huge hand came in and grabbed his mother. The flock was now high in the sky, and his father, too, who had never found his way in, was with the rest of the flock. The hand came in again, and grabbed him. Flutter and peck as he did, he couldn’t get that hand to let go. At first he though he was going to get eaten, then and there. But then he was rammed through a hole into a much smaller, tiny little twig box. Were was that hole? Well, there was nothing there now. Only solid bars. He flew at them a few times. No, just solid bars. Did he hear a click, or a sliding sound? He crashed straight into a bowl of water. Put there to drown him? He crashed straight into a bowl of seeds. They went flying everywhere. There was barely room to turn round. As he tried, he went bang into a stick going across the cage. 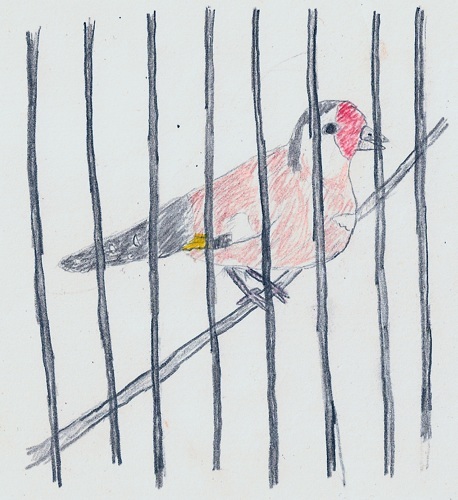 He vainly flew towards the sky, but he banged into the bars at once. Crash! Something startled him, and he saw another goldfinch crashing into the bars of a box next to him. He could hear the clattering of a bird above his head. Splash! He shook water from his feathers and beak. The goldfinch above him had upset her water bowl. It hadn’t stayed in her cage for long. As it became dark all the goldfinches stopped struggling. One by one, they hopped onto their perches. As he hopped onto his own perch, the young bird thought he could smell a faint scent of wild onion. The days went by. Each day was the same as the first. There was never a glimpse of the sky. The days grew colder. The man’s nine year old daughter called him Goldy, and the one next to him Redcap. His mother, the other side of him, was Flutter. He knew nothing of this. One day, a few months after “Goldy” was captured, the man’s daughter grew impatient. “These goldfinches are getting boring. I want a baby finch.”. “Oh yes!” cried the daughter eagerly. “I’ll put Goldy and Redcap together.” Goldy was our hero’s new name. The bird that the girl had called Redcap was a healthy fine young male, a few weeks younger than Goldy. Both had been healthy birds, but on a diet of canary seed and plastic tasting water neither was quite as well as they might have been, and neither of them was old enough to have a mate. They were both put together in Redcap’s tiny cage. Of course the girl had always imagined Redcap as a boy and Goldy as a girl. As I said, neither were old enough to have a mate, and if they had been they most definitely would not have chosen another male! 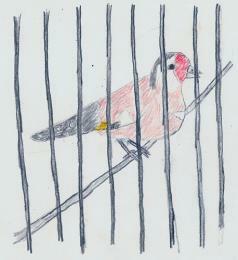 Goldfinches are always sociable birds, but being put together in such a tiny cage was begging for a fight. And that’s what she got. They both flew at each other, with the girl sitting anxiously the other side of the bars, wondering if it was a courtship display. After a while the girl put them back in their own cages, disappointed. It soon began to get fresh and warm again. It was spring! Goldy felt he was missing out in his stuffy little cage. He heard the birds twittering out side the window. They were enjoying themselves! It was soon warm enough to put the cages outside again, like it had been when they were first captured. But this did not help. The goldfinches flapped and crashed, trying to fly in the breeze. Could he smell a wild onion? Could he? Anyway, he knew he could see some flamingos flying by. They were probably going to the saltpans. One day the man’s wife came outside to see a girl a little older then her own standing watching the birds, perhaps feeling rather sorry for them. She knew this girl. She stood watching her interested face with surprise. “You want one?” she inquired carelessly. The man studied the girl, and shrugged her shoulders. “Well,” he seemed to say. “If you say so. 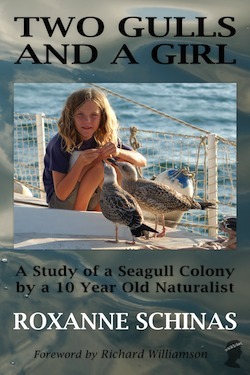 They’re not my birds.” He unstacked a cage and gave it to the girl, who hurried off. In that cage was Goldy, madly fluttering. As the girl stopped walking, Goldy began to calm down. The girl set Goldy down on her lap and began to talk with her mother. Goldy smelled something that made him uneasy. He didn’t know what it was, but he didn’t like it. Then he saw what it was. A dark, mottled creature crept along the ground. Two golden eyes stared up at Goldy greedily. Goldy had never seen something like it before, but he didn’t like the look of it. He crashed at the bars on the far side of the cage, but he couldn’t get away. “Go away, Truco,” said the girl. The animal rose, spitting angrily. Puffing its tail it stood, staring enviously at Goldy. “Shoo!” It turned and stalked angrily down the room, staring over its shoulder at Goldy, who was still anxiously banging and crashing at the bars. It paused at the doorway of the room. “Go on!” The animal disappeared, but its smell hung thickly about the room and made the bird uneasy. Goldy’s cage was put on a bed, with the blankets tucked up around the cage. He was just beginning to dose off when he smelled something else. A whimper made him look towards the foot of the bed. A huge furry head stuck over the edge of the bed. The animal gave a whiny little bark, and its huge feet scrabbled at the edge of the bed. Behind the head a tail wagged furiously. Goldy was carried through the rain to a big, cold car, where he was put into a much bigger cage. Then the girl and her mother went away, leaving some seed heads for him. Yum! They tasted a lot better after a year of plain canary seed! The goldfinch stayed in that cage for two or three days. Then, once it was sunny again, one nice autumn day, the girl, her mother, and her father all got into the car. Goldy fluttered against the bars and tried to get away. Then – BROOOOOOM! A terrible noise startled him. It died down to a load “CHUG CHUG CHUG”. The cage jolted on the table and slid about. The noise carried on for a while. Then, eventually, it stopped. The cage was suddenly lifted up as the man carried it outside. Goldy fluttered at the bars for a while. Then he felt a place in the bars which he didn’t bang into! Out he flew, up into the blue sky. “Hurrah!” he sang! It was the first time since he had been caught that he had sung his lovely song. He was freed from his cage, freed from his silly name, and his boring food. He headed back to the saltpans, where the flamingos and avocets live, to the trees where he was born. He never came back to town again. Being a particularly strong, brave, handsome, bird, who had learned many lessons, it is quite probable that he lived to a ripe old age and raised a number of broods. He almost certainly met with the flock, down by the saltpans. Maybe, as we sit here, he is smoothly and gracefully snatching up the flying ants and taking them back to his brood. get anywhere from 50 to 150 Goldfinches at my feeders pretty well all summer. Keep up the good work with your writting and someday we may find you in a hardcover book.